Sidbury W.I. 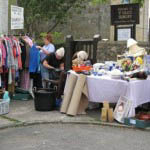 is very much in the heart of the village welcoming old and new members. It is a good way to meet people and make new friends. The ages of our members span 5 decades. We have interesting speakers and enjoy a chat over a cup of tea or coffee. We meet in Sidbury Village Hall on the first Wednesday of the month at 7.30pm. and you are very welcome to come along as a visitor. New members are always welcome. We hold a Christmas coffee morning in November, a Pancake Coffee morning and a Hot Cross Bun Coffee morning. Sidbury W.I. 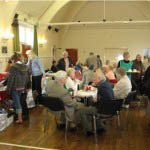 was founded in 1953 and each year in March we have a supper and entertainment to celebrate Sidbury W.I's birthday. 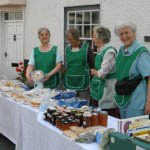 As a WI we are keen to raise money to help the local community. 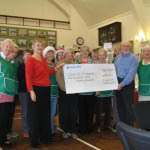 Amongst others money has been raised for the Devon Air Ambulance, the Sidvalley Memory Café and the Sidbury defibrillator. 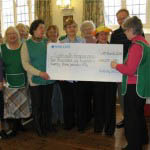 In 2016 we raised money for ACWW, a charity affiliated to the WI to provide money for birthing partners in Ghana. We have an outing in June each year. In June 2016 we joined in with the Friends of St. Giles for a coach trip to Bath and we had a very enjoyable outing to the Honey Farm in September. Keep fit, held in the Parish Room on Monday 10.15 - 11.15 am started as an offshoot to the W.I. Sidbury W.I. 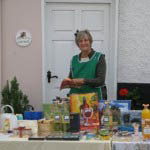 is part of a group which includes Branscombe, Core Hill, Sidford, Pebbleford and East Budleigh W.I.s. and we have group meetings yearly. 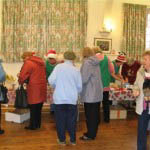 There is also a group Carol Service each year and other group events such as skittles. Being part of Devon Federation of W.I.s some of our members attend Council meetings held in Plymouth, Torquay or Barnstable. There have been some wonderful speakers including Kate Humble and Lesley Garrett. Sidbury W.I. is well known for its catering but this is definitely not a prerequisite for joining our W.I. We have some members who have no interest in this area at all. 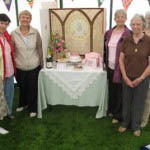 If you would like more information telephone, secretary; Janice Faulkner 01395 597521.